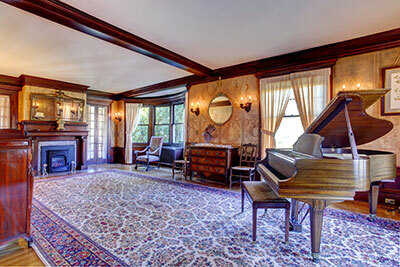 Maintain and preserve the longevity and beauty of your Oriental rugs and other fine textiles in Palm Beach, FL with rug protection treatments from Delray Beach Oriental Rug Cleaning Pros. We offer stain, odor and insect repellent treatments to protect your natural and synthetic area rugs constructed of fibers such as wool, silk, cotton, polyester and other various blends. Our rug protection treatments are safe, hypoallergenic and non-toxic for your family and pets and will gently protect your area rug without harsh chemicals that can damage rug fibers. Applying a rug protection treatment like our fiber protector and stain repellent will retard soiling and help prevent spills, stains and pet odors from becoming permanent. Our specialists will gently and thoroughly clean your area rug before applying our rug protection treatments that protect your rug from stains like wine, soda, coffee, juice and chocolate and pet accidents. Our moth repellent treatment will also protect your fine wool Oriental rugs from moth damage. Additionally, our team also specializes in pet stain and odor removal. Let’s be honest, no matter how well trained your pet may be, there will always arise situations that will provoke an accident; leaving you in need of pet odor and urine removal services. While cleaning the area yourself may make things look better; the ugly truth is that these types of pesky odors will most often remain in the carpet making your home smell bad. Delray Beach Oriental Rug Cleaning Pros proudly provides specialty services to remove pet odors and urine that are designed to leave your carpet looking and smelling fresh again. Not only does our pet odor and urine removal service provide a fresh clean scent, it also uses triple action cleaning, which is designed to destroy odors at their source – not just mask them. This service is perfect for removing any evidence of your pet having an accident. At Delray Beach Oriental Rug Cleaning Pros, we understand the art and construction of rug weaving and the care of each unique rug. Our process includes thoroughly inspecting each rug to insure the correct cleaning procedure as we understand not all rugs have the same fiber content or dye structure. 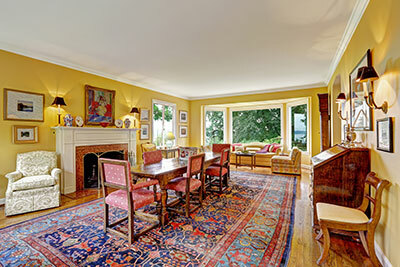 We also offer a wide variety of Oriental and specialty rug repair. Our skilled rug experts are trained in machine-made and hand-made oriental and specialty rug repair. Before any repairs are made, we offer a quote and level of repair based upon sentimental and monetary value. For machine-made rugs, our experts can apply new fringe. Hand knotted rugs require end finishing by opening, securing and constructing new fringe. To prevent unraveling, your rug requires side construction with the appropriate thread, i.e. wool, cotton, silk or synthetic. We hand serge your rug to secure side finish —otherwise known as serging or overcasting —for strength and appearance. Rugs known as tufted or hooked construction, utilize backings for strength and appearance. We are able to replace backings that are worn and damaged. 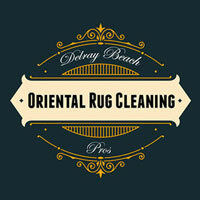 At Delray Beach Oriental Rug Cleaning Pros, we truly understand that each rug is unique. We thoroughly inspect every rug's material and condition to determine the best possible cleaning process for each individual rug.